Dog clothing interests me. These days, our canine housemates have protective rain coats and boots, down vests, Christmas sweaters, and Halloween costumes. Some years ago, I saw a “wiener dog parade” in New Orleans that included cheerleader outfits, superhero capes and — best of all — dachshunds dressed as wieners in buns with mustard and ketchup. The humor that we dog owners seem to get out of canine dress-up seems unbounded by anything except our budgets and the tolerance of our foot-footed buddies. 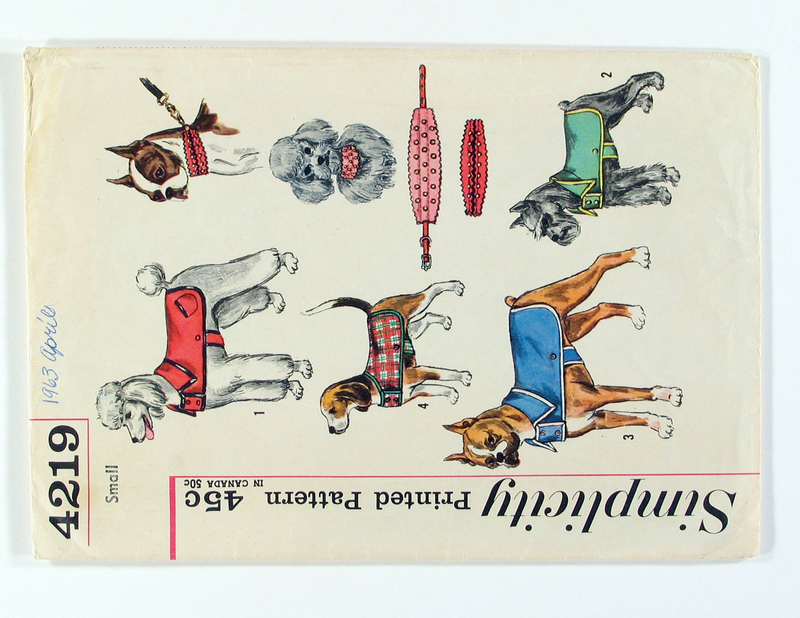 Catalog page of dog accessories, Von Lengerke & Antoine, Chicago, IL, ca. 1910. In an earlier blog post, I discussed a pattern for a crochet dog coat that was publishined in Godey’s Lady’s Book in 1873. It was ornamented with a fringe and small jingle bells. However, dog clothing of the late 1800s and early 1900s was simpler than that Victorian fantasy. 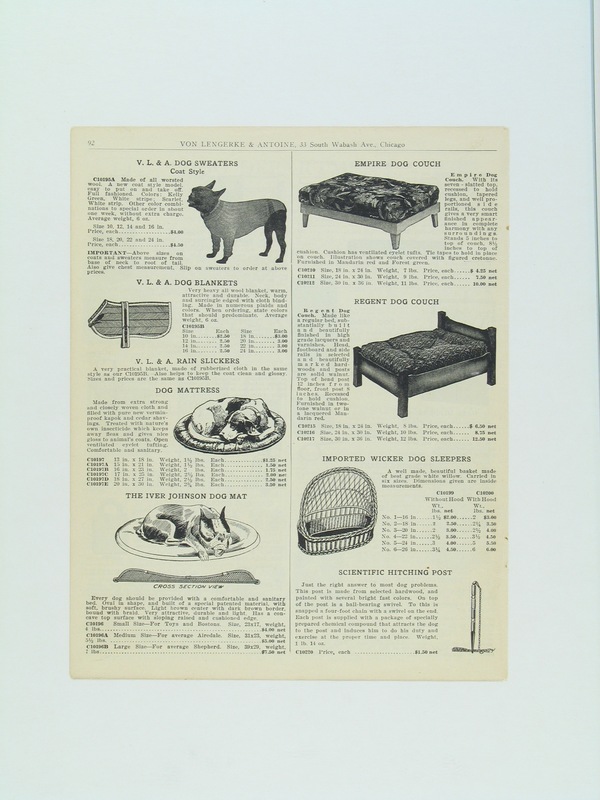 Here is a page from a catalog by Von Lengerke & Antoine, a Chicago sporting goods company that was in business between 1891 and 1938. The page dates from around 1910, I believe. Dog owners shopping in the store or via the mails could purchase sweaters, “dog blankets” that looked like miniature horse blankets, and rain slickers. Dog coat, maker unknown, American, ca. 1950. Wool, buttons and metal buckle. By the 1940s, the appearance of dog clothing increasingly paralleled human dress. This little coat, which dates from the late 1940s or early 1950s, is made from a woolen fabric woven in a version of a “buffalo plaid.” In clothing for people, buffalo plaids are fabrics woven in large-scale red-and-black checks; the patterns date back as far as the 1850s. 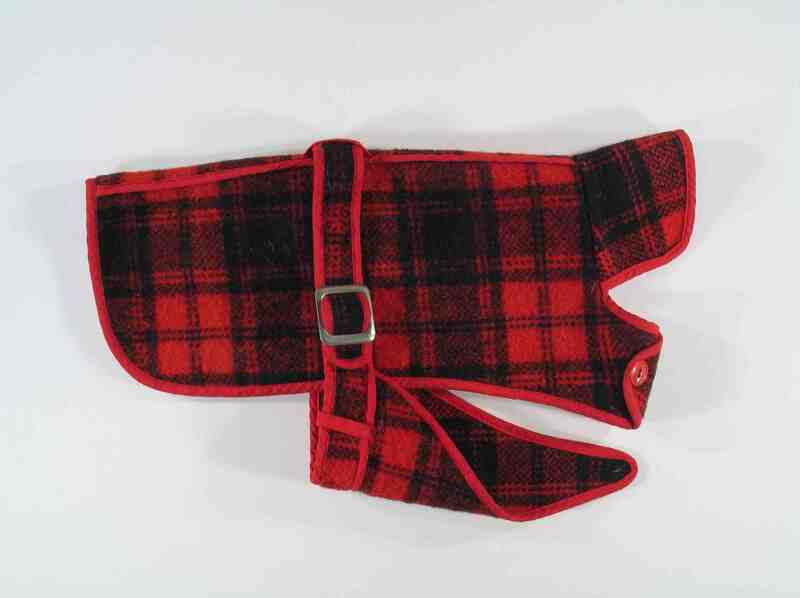 Buffalo plaids were popular for mens’ and boys’ jackets in the 1940s and 1950s — and here it is made up the family dog. 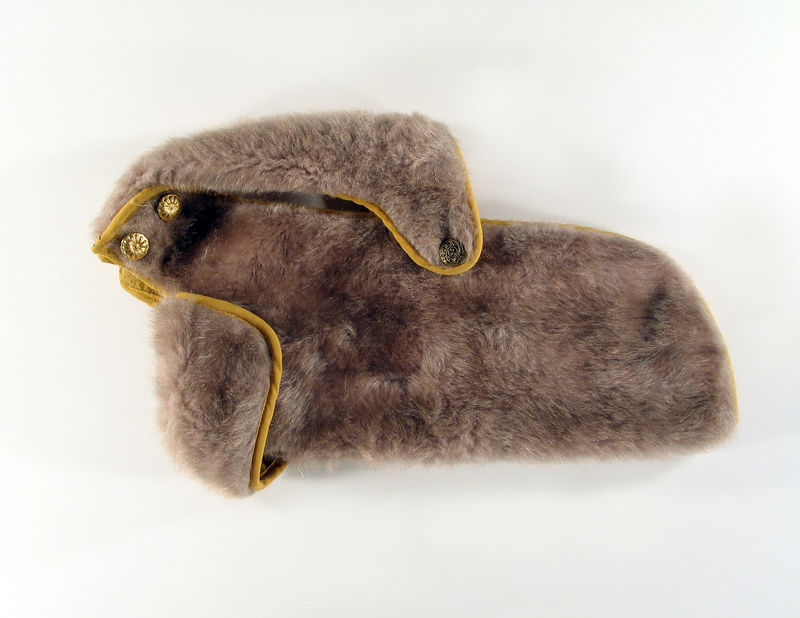 Dog coat, faux fur, cotton and metal buttons, between 1965 and 1974. Made for Gigi Herman (1964-1974) by Lynda Herman Chaney. The 1950s and 960s were the glamour decades for doggy dress — just as they were for women’s clothing. Most of the dog coats and accessories from the era that I have found were scaled for very small dogs — another fad of those decades. This was the heyday of the miniature poodle in particular. Lynda Herman Chaney made this faux fur coat for Gigi, the miniature poold owned by her mother Juanita Herman of Kansas City, MO. Mrs. Herman was a fashionable dresser and, since Gigi needed protection from the cold winters, she dressed her in coats with boots and even matching hats. Lynda Chaney could have used this pattern for Gigi’s coats. This copy of Simplicity Pattern 4219 is dated in pen “1963 April,” but the pattern itself dates from the 1950s. I like the array of dogs illustrated on the envelope: poodles, a boxer, a Boston terrier, a beagle and a miniature schnauzer. Most of these breeds were represented in my childhood suburban neighborhood in the 1950s and early 1960s. Notice that the all-American beagle is wearing a manly plaid coat, rather like the one illustrated above. There’s more to say about doggie glamour of the 1950s and 1960s. From rhinestone-encrusted collars to nail polish, the developing pet products industry capitalized on the new prosperity of many Americans in those decades. I’ll share some of those products with you in a future post.